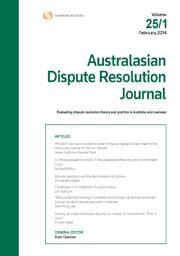 The August issue of the Australasian Dispute Resolution Journal (Volume 23.3) is a special edition dedicated to examining the teaching of alternative dispute resolution (ADR) in universities, and the promotion of students’ well-being. The articles all originated from RMIT’s Forum, ADR in Legal Education and Promoting Student Well-being, held on 20-12 February 2012 at RMIT University in Melbourne. Keynote speakers at the forum included Professor Tania Sourdin, and United States’ specialist Associate Professor Molly Townes O’Brien. The special issue was conceived and guest edited by two esteemed Australian academics in the ADR field: Kathy Douglas, Senior Lecturer at RMIT and nationally accredited mediator; and Rachael Field, Senior Lecturer at QUT. “ADR in legal education: Learning by doing” by Judy Gutman and Matthew Riddle, which explores practice-based courses, using the example of La Trobe University’s inclusion of dispute resolution as a compulsory, stand alone, first year law subject, which uses role-playing as a central part of teaching the mediation process. “Teaching self-reflection to law students in a dispute resolution unit” by Olivia Rundle and Sarah Hiller, looking at the University of Tasmania’s undergrad dispute resolution unit, which has an emphasis on teaching self-reflective skills to students. “Not teaching ADR in law schools? Implication for law students, clients and the ADR field” by Tania Sourdin: An in-depth look at the consequences of not including ADR in the law curriculum and the disadvantages faced by law graduates and who have not completed ADR training. “Student reflections on the benefits of studying ADR to provide experience of non-adversarial practice” by Pauline Collins, looks at the students’ opinions after having completed the University of Southern Queensland’s Legal Conflict Resolution subject, and finds an overwhelmingly positive response to the different skills taught.